Immigrant from Honduras pled guilty to attempted robbery, not understanding that he would be deported as a result. 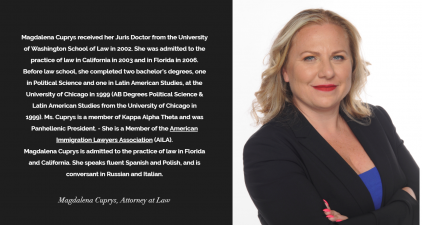 MIAMI - Aug. 20, 2018 - PRLog -- Cuprys and Associates (Miami/Clewiston, Florida) announced today that immigration Lawyer Magdalena Cuprys successfully got the criminal conviction of a young client vacated and set aside, thus giving him a chance of staying in the U.S. instead of being deported. Ms. Cuprys explained that the client, H.C., is only 21 years old and originally from Honduras. He came to the U.S. at age 8, and at the time of the events held a U.S. work permit under the "deferred action status for childhood arrivals" (DACA). According to the records, he attempted a strongarm robbery and petit theft in 2015 when he was 19 years old, and was arrested as a result. H.C. had allegedly tried to steal someone's bag. While represented by another attorney, H.C. plead guilty and the Circuit Court (Eleventh Judicial Circuit, Miami-Dade County) thus found H.C. guilty and ordered 2 years' probation. As a consequence of the guilty plea, H.C. ended up in deportation proceedings and was picked up by officers of the U.S. Immigration and Customs Enforcement (ICE). While the deportation proceeding was pending, Attorney Magdalena Cuprys filed a Motion in the Circuit Court to vacate H.C.'s judgment and sentence, based on Padilla v. Kentucky, 130 S.Ct. 1473 (2010) and Julien v. State, 917 So.2d 213 (Fla 4 DCA 2005). Ms. Cuprys argued that the prior attorneys did not take all necessary action to protect H.C. In particular, H.C. did not know that the guilty plea would subject him to deportation back to Honduras. Also, according to Ms. Cuprys' filings, the bag that H.C. allegedly tried to steal was in fact his. The Circuit Court of the Eleventh Judicial Circuit (Miami-Dade County) now granted the motion that Ms. Cuprys had filed. After the Court granted Ms. Cuprys' Motion to Vacate, the State of Florida announced that it would "nolle pros" the charge - the finding of guilt be vacated and set aside. Note: "Nolle prosequi is a Latin phrase meaning "will no longer prosecute." It is equivalent to a dismissal of charges. Ms. Cuprys stated she is pleased with the decision. "H.C. came to the U.S. as a child as the result of child trafficking and has lived here ever since. If he were returned to Honduras, a country unknown to him, he will be subject to gang violence and torture. The Court's decision gives this young man a chance to seek an immigration bond and stay in the United States of America." The underlying case is #F15020585 (Circuit Court 11th Judicial Circuit, August 16, 2018). Magdalena Cuprys received her Juris Doctor from the University of Washington School of Law. Before law school, she completed two bachelor's degrees, one in Political Science and one in Latin American Studies, at the University of Chicago. (AB Degrees Political Science & Latin American Studies from the University of Chicago).